Frederick was born on 8 March 1891 in Pembroke, Wales, the son of Charles John Eary, a professional soldier, originally from Romford, Essex, and his wife Elizabeth, née Horn. The family lived in Arthur Street in Pembroke Docks where Charles was posted as a Quartermaster Sergeant with the 2nd Battalion, Duke of Cornwall’s Light Infantry (DCLI). They then moved to Bodmin, Cornwall, home of the regiment, where young Fred was educated at the County School. After school he evidently decided on a career in farming and went to work as an assistant to Philip Bomford at his farm in Adlestrop, Gloucestershire. Meanwhile his father’s career progessed well, he was commissioned as Lieutenant and Quartermaster in the DCLI then promoted to Captain. By 1911 he was retired (aged 52) and he and Elizabeth were living in Reading; the following year they moved to 1 Woodspeen Terrace in London Road, Newbury. To be a farmer requires a farm, which was not easy to come by without the wherewithal to buy one, so Fred took the option (taken by many young men in that period) to seek land in the colonies. In his case on 23 March 1912 Fred set sail on the SS Royal George, bound for Halifax, Nova Scotia and thence on to Canada. Once in Canada he found employment, not as a farmer, but as a sailor, probably on the ships plying their trade on the Great Lakes. Following the outbreak of war in 1914 Canada immediately began supplying troops to fight for the mother country. Fred enlisted at Niagara-on-Lake, Ontario (the border town close to the famous Falls) on 1 October 1915. He was assigned to the 58th Battalion, Canadian Expeditionary Force (CEF) as Private 453784 Eary. Private Eary arrived in England with the rest of the battalion on 2 December 1915 and went with them to Liphook in Hampshire where they would prepare for life on the Western Front. However, Fred did not accompany the battalion when it left for France in February 1916; on 12 January he was discharged from the CEF, not for reasons of injury or sickness but because he had applied for a commission with the DCLI and had been accepted by his father’s old regiment. Not that it was really Charles’ old regiment by then because he had returned to the Duke’s at this time of need, so Captain Eary was back in harness at the Regimental HQ in Bodmin. Cadet Frederick Eary joined the No 1 School of Instruction for Officers at Bedford, graduating on 24 February 1916 – not a long course. On 28 February he joined the 9th Battalion, DCLI, as a 2nd Lieutenant. More training followed as he learnt to be an officer during six months with the Regiment in England before he left for the front in September 1916. As an officer he had privileges he could only have dreamt of when he was a Private – one of which was the services of a batman, in his case this was Pte H Hodge. 2nd Lt Eary evidently settled in and survived his first few months in the trenches. In the context of this war of attrition an officer who survived tended to see rapid prpmotion, in Frederick Eary’s case he found himself promoted to command a company (around 200 men) on 12 April 1917, after only a year with the battalion. His promotion from Temporary 2nd Lieutenant to Acting Captain (leaping the 1st Lieutenant rank) was gazetted in July 1917. He became company commander of A Company responsible for the day to day well-being of his men and for leading them in the field. Affectionally known as ‘Skipper’ by his men, he was a well respected officer whose bravery gained him a Military Cross, probably earned during the hell on earth that was the 3rd Battle of Ypres (often referred to by the name of one of its component battles, the Battle of Passchendaele). The local paper carried the news of his MC, which, by chance, coincided with his father’s promotion to Major. Captain C J Eary, of Woodspeen Terrace, has recently been promoted to the rank of Major. Captain F C Eary, son of Major Eary, has been awarded the Military Cross for distinguished conduct in the field during the recent fighting. Six months later in the early spring of 1918 the British Army found itself in an unfamiliar situation as massive German attacks smashed through their lines and threatened to break out through the in depth defences behind the front line. For a while it even appeared that the Germans could split the Allied forces trapping much of the BEF in a pocket with their backs to the sea (as was to happen in 1940). Desperate fighting, often by makeshift battalions thrown together using the remnants of shattered battalions, eventually saved the day, but many thousands of troops died in the struggle. The 7th DCLI were part the 61st Brigade in the 20th Division in XVIII Corps of the Fifth Army, commanded by General Gough; it was the Fifth Army that took the brunt of the German onslaught. When the attack began on 21 March 1917 the Division was one of three that formed the Army’s reserve. By 23 March all the reserves had been thrown into the effort to halt the Germans. On 24 March the Division was still in good condition (unlike most others from the Fifth Army) and was entrusted with holding the left of XVIII corps section of a makeshift line along the River Somme. Their position was a bad one, incorporating a salient almost surrounded by Germans. At 9.05am the 61st Brigade were ordered to begin to withdraw from the salient at 11.00am. The officers and NCOs had less than two hours to organise the withdrawal; while doing this Frederick was first wounded in the arm and then killed by a sniper as he continued to go around A Company getting ready for the move. I sincerely hope you will not take it as impertinent on my part in now writing to you, but as I have had the honour of being your dear son’s batman since he landed in France in 1916 I feel it my duty to let you know as much of dear old Skipper’s death as it is possible for me to tell. Please Sir do not think because I call the Captain, “Skipper” it is with any disrespect to the Captain, because he was known by all his boy’s as “Skipper”, & believe me but not a finer soldier or gentleman ever stepped on the battlefield of France. It was on the morning of the 24th March that we dug ourselves in & after getting certain orders from BHQ the Captain went round his company with orders & was wounded in the arm, but like the gallant officer he was, he still carried on, & about 10 o’clock and enemy sniper caught him in the lungs death being practically instantaneous, & sir I think you agree with me that it was better to have died instantly than to have had a lingering death. I am sorry I cannot tell you any more than I have done, as I was put out of action with a machine gun bullet about three minutes after the dear Skipper’s death. Please Sir accept my heartfelt sympathy in your sad bereavement, but everyone in the Batt held Capt F C Eary, MC in the greatest esteem, & believe me that A Coy has lost one of the most considerate & bravest officers they have ever had. Such was the confusion of the situation that his parents were first informed that he had died sometime within a 7 day period (21-27 March) and it was letters from Pte Hodge, the battalion Chaplain and a fellow officer that first told the actual date of his death. Pozieres Cemetery and the Memorial to the missing. 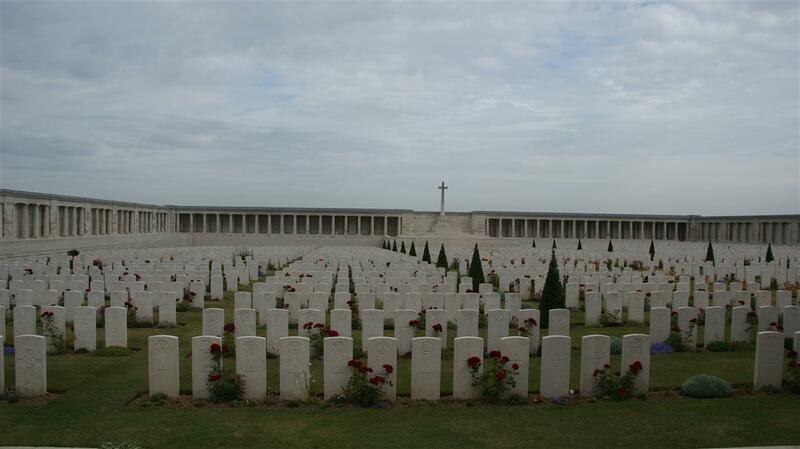 Frederick’s body was never identified so he has no grave; his name is remembered on panel 45 of the Pozieres Memorial to over 14,000 men who lost their lives on the Somme in 1918 and who have no known grave. 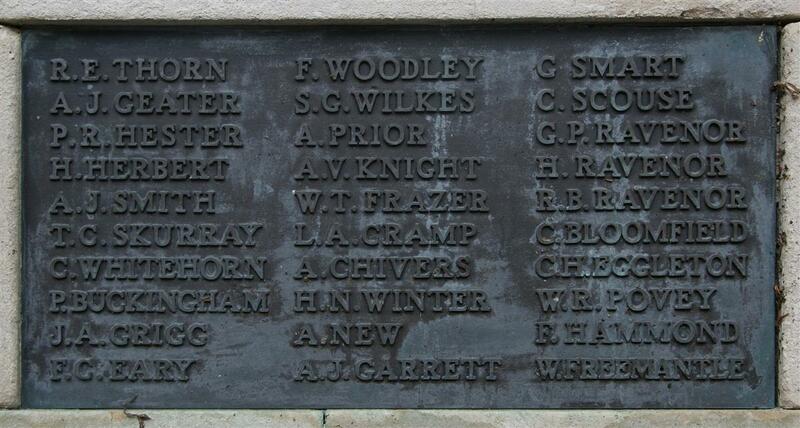 His name is on panel 12 of the Newbury Town War Memorial, the Speenhamland Shrine (formerly in St Mary's, Speenhamland but now in St Nicolas' Church, Newbury) and the town war memorial in Bodmin, Cornwall.